-Get them to take an action. How to do this is really not rocket surgery. It’s a skill that this book will teach you in 16 steps for less than your daily latte. A website that does not get readers to take action is just a pretty calling card on the web. This guide will teach you the principles behind why readers take action on web pages and how to help them do just that. If you understand your audience, you’ll know how to write in a way that captures them quickly. It’s not about manipulation. It’s about getting out of the reader’s way and making sure they find what they came looking for. 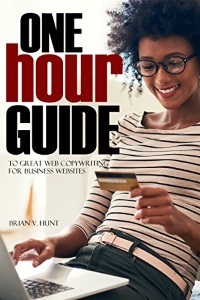 This book contains 16 steps that help you be a better web copywriter, increase your productivity, make your clients or your boss want to kiss you, and might just protect you from vampires. Whether you’re a seasoned web copywriter writing for clients, a newbie, or you’ve just been tasked by the company’s web committee to come up with dazzling content, you can write better content that achieves goals for you and your audience. To that end, it’s useful as writers to understand that our job is not to manipulate web visitors into doing something they don’t want to do. Our goal is to help website visitors achieve their goals, which is to solve a problem or answer a question. This isn’t altruism. It’s simple pragmatism. Here’s my promise to you: if you put these 16 steps to work, I guarantee it will make you a better web copywriter. Writing for the web requires a different structure—a specific structure—and a different mindset than other kinds of writing. Within that structure, you can be creative, serious, instructive, and completely ridiculous if it grabs your audience and gets them to take action. Writing for the web is great exercise for all writers because it requires economy. You must be concise on the web. The author must now write in the third-person to suppress a gag reflex while lauding his own accomplishments. He was a lead writer for nearly fifteen years in Microsoft Game Studios on such products as Flight Simulator, Combat Flight Simulator, Halo Wars, and Age of Empires. He has written hundreds of thousands of words for games and hundreds of thousands more for websites in a wide variety of industries and small businesses. He was director of digital marketing for a design studio, where he managed a team of writers and SEO specialists who were so talented he eventually told the president he was superfluous (the author, not the president). He is now a freelance writer, editor, and publisher of some repute to his friends and family. He has a degree in psychology (taken in the mistaken notion that he would come to understand himself) and is a lifetime acolyte of that discipline. He is fascinated by and endlessly studies what makes people interact with websites. He is a private pilot and an amateur Egyptian archaeologist. That was painful. Throughout the book, I refer to “your website.” This is because I don’t want to type “your website or your client’s website” in every instance. Just assume that I mean both because this book is for people writing for their own business, a company they work for, or client sites.